Hey there! Long time no craft, huh? Seems to be the norm for me lately. Priorities, you know?....seems like there's always something more important to get done than crafting.....but today I MADE time! I was totally inspired by this awesome card by Jen del Muro and couldn't wait to play with my MFT heart dies and make a card. As I mentioned, the hearts were cut out with MFT heart Die-namics. The papers are a mix of Imaginisce, Stampin' Up, Cosmo Cricket, and (I believe) My Mind's Eye. The orange and blue hearts are taped onto the white panel with adhesive. 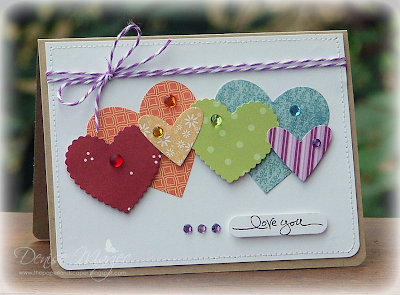 The red, yellow, green and purple hearts as well as the punched sentiment (by Stampin' Up) are up on foam tape. This is GORGEOUS girlie!! WOW! I LOVE this! This is just awesome! I love the papers you put together for these... everyone is just perfect! Gorgeous! Oh wow!! 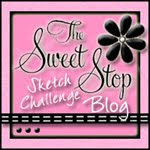 This is so fun and pretty! Fabulous job! I just LOVE this one!! It's all good!! Nice job, on this fun, and cheerful card! Love everything rainbow!!! Awesome my friend! Glad you are enjoying pinterest ;) hehe! You ALWAYS find the prettiest papers! Love this!